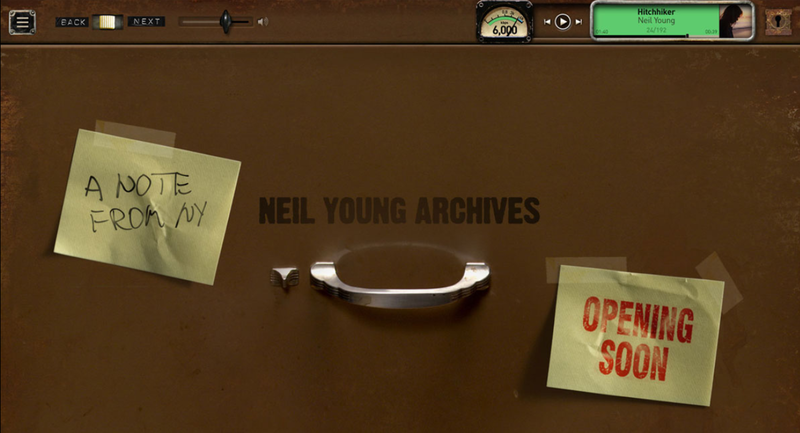 Neil Young News: Neil Young Announces Online Archive: "Opening Soon"
Neil Young has announced that an "online archive" -- with nearly all of his recordings -- will be "opening soon." Back in April, Neil Young seemed to indicate that PONO was no longer viable and a new high-definition streaming service called Xstream Music was the future. This digital archives will contain Young's entire catalog with "unreleased albums." The announcement coincides with Young's just-announced Hitchhiker, an all-acoustic LP that he recorded in 1976 but never released. More on Xstream: Neil Young’s New Streaming Service. This is great news from a perspective of having access to all of Neil's work, BUT, here we go again with another costly subscription service which leaves people with no physical product. How many people coughed up the bucks for PONO players which are now gathering dust having been promised a fabulous, permanent, online streaming service? Or bought the blu-ray version of Archives volume 1 with it's promise of future access to all sorts of goodies? Both of those services are discontinued, & now Neil wants us to put our money & faith into yet another unestablished & potentially temporary streaming service. If my internet is down I can put a CD in the player & enjoy, now what's wrong with that? Neil's reliability record with this kind of thing is shaky to say the least, and while I've no doubt that his intentions are good, I imagine there are a lot of people who are feeling "once bitten twice shy" about this. Which is a great shame, as what is coming our way is the holy grail. If they were physical releases I know that my credit card would be taking a hammering pretty soon, but, as it stands I won't be coming to the party. I was looking forward to adding Vol.2 of the archives boxset next to Vol. 1 on my shelf. It's nice Neil will have his entire timeline online, but I found the packaging and presentation of the Vol.1 boxset to be second-to-none. Furthermore, nobody wants to fork out more cash for yet another music streaming site. Maybe Archives Guy can enlighten us with some details. Don't want No Streamin', (subscription or otherwise). @Old Black: Pono wasn't a streaming service, it was a download store with an associated hardware player which still works just fine for listening to hi-rez (and lo-rez) audio purchased from any provider. @Chad: Archives Guy left the building long ago. still works fine? yer one of the "Lucky" ones, I'd guess? My NY & CH LE was repaired once, under warranty, whilst PoNo was still viable and while I was in favour w/ the powers that be. It has since died a slow death. PoNo #2 & 3 (yellow & black models) purchased from a retailer online brand new are now showing symptoms of same initial service problem w/ LE player. Horrendously slow load times. The internal 64GB memory is severely flawed. handled with the utmost of care, no players in my possession have ever been used outside the confines of home. They are just not made very well. maybe corners were cut on the internal memory to keep costs down. but it is a flawed product, none the less. I have no music files on the internal memory any longer. can't tell you how many Sandisc cards these players have fouled. I think Neil wrote "Piece Of Crap" w/ PoNo in mind......Hard Copy OR BUST! don't want No More Gimmicks! @herbsworld: Don't own one myself, but continue to hear nothing but good things from those who do. Point is, people keep saying the player technology automatically became obsolete when the download store closed, and that's simply not true. Chad: Archives Guy imploded after marketing for Archives Vol 1 was completed, and everything (I'm exaggerating for effect, but not by much) he said turned out to be complete nonsense. He vaguely reminded me of Dom Joly's "Don't trust this man" character from the British hidden-camera show "Trigger Happy TV". Re: an Archives website. I love Neil's persistence with this, trying to find the perfect medium for presenting his Archives in all their glory. He's got a vision and he is working hard to achieve it. And I love the concept behind it, following the same (wonderful) blueprint as the "filing-cabinet"-based Vol 1. It's impossible not be enthusiastic about this! Until, that is, you consider Neil's track record on these things. He's very good at starting projects; not so good at finishing them or, more importantly in this case, maintaining them. Which is the whole point of an Archive. It needs to stand the test of time. That is crucial. You would think a new Pono mark2 that worked a long side the website would be the go. The sdcards was a great idea... down load and then play it. ..guve ti friend... buy another sdcard doneload another gem play it and so on...in the real world i luv giving a mate a cd and saying play that...Is baby being thrown out with the bath water? Or Better yet, Blu ray! Right on. I agree. I will not stream. Alan in Seattle. I agree. Alan in Seattle. Yes. Give me another Blu ray Archives, Volunteer 2, please. And come back to the Pacific North West to play another live show, Neil. Glad I saw you in Seattle & Boise with PotR! Neil's PONO - stick with the 'knitting'. Let's just have the music. Sorry Neil, you dream big but deliver very little of interest anymore. Look at the way Dylan has preserved his legacy consistently with minimal fanfare. I don't know what your big shot management is doing for you but it's not serving your fans and probably wasting you a lot of money. So what will it costs? Monthly subscription / annual / one off payment / free? Just give me the CD's and I'll be happy, even a download but be preferable to streaming. Let's get back to MONO eh! This technology will come back to bite us, what on earth do you want to have unfinished work, unsure of artwork blah, blah. I think Neil's hiatus has given him to much time to think. The magic has gone,waitng for that one album a year and happy to shell out for.No more No more! My initial reaction to this was similarly negative ... I don't stream music and grew up in the vinyl and audio cassette era and like owning the product ... I think for Neil this is truly about catering to what he wants. 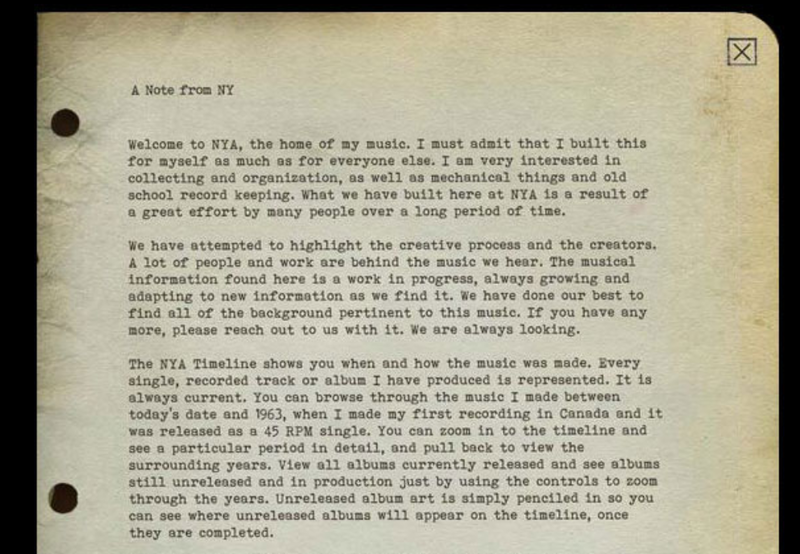 It seems its always been his vision to have his massive cannon organized and itemized with all of the data, all of the context, the virtual file cabinet of sorts ... for the most part he's always been about doing what strikes him as an artist, fans be damned, and to some extent that explains his vibrancy, longevity, relevancy even if its a sometimes frustrating to be a fan ... as a fan who owns a lot of his work including Archives I in Blue Ray (never once played), its also frustrating to consider toggling between two formats w overlap, 'i'e much is owned some will have to be streamed ... in that case once I'm streaming what good is what I own? The other annoyance is the thought that although I own so much I'm effectively agreeing to a monthly payment for the rest of my life for the fill ins and newer soon to be released material ... I don't think this is a deliberate cash grab at all but its potentially a sweet deal for the artist who will have recurring revenue basically forever ... turning the tables and asking "what could be great about this" I come up with a thought that perhaps the need to own the music is backward looking and perhaps this format is the efficient way to access the entire catalog inclusive of new material as it comes on stream ... perhaps stuff i wouldn't not have ever bought will end up being my favorite material, the concept of Blue Ray downloads with all the technical snafu's go away here, and the music business profits get cut out of the system ... in the end writing this has helped me feel better about this however bottom line for me is if Neil accelerates the dissemination of stuff stuck in the vault then I'll view this as good, if stuff is trickling out willy nilly then perhaps less so .... finally, Neil needs an archivist like Briggs was a producer, stop seeking perfection release the dam while fans are able to enjoy it .. and also start recording live shows in 3D so fans in the future can re-experience the shows in their finest form, the technology is available!! I think it's more about creating a living archive, while he's still alive. Bob and Lou Reed have created physical locations for there Archives which allows them to continue to collect more material. Neil must think his archive is incomplete and that more material WILL be discovered so he needs to create something like this. As soon as he puts it in a box it becomes a finite thing, even with the BDlive thing. I hope the website fills in the.what is missing from the volume 1 box, could be really good like that where they don't feel the need to leave things out. But I do definitely want a Blu-Ray box to match my first. Now the ultimate NY Archive would be something where someone purchases the ranch and turns it into the NYA! That would be amazing! In fact I think we should start putting a fund together so if it ever comes up for sale we can act quickly and buy it as a collective. I'll start with $100 Canadian!! Unfortunately this is more "pissin in the wind"
Still using my Pono player every day without any failures. Have no interest in streaming so I guess I'll keep buying product from other sites. Sorry that the Pono store will not open again but it's not unexpected. I like Lionel trains, too! Mister Young has been letting his fans down now for decades, with empty promises and gimmicks. Growing up he was one of my all time favorite performers. A brilliant songwriter and fine guitarist. Over these last 20 years or so, he has become about as reliable as a Washington D.C. politician. I sadly don't trust anything he says and don't believe a word that comes out of his mouth anymore. I will just continue to enjoy his recorded legacy from 1980 backwards and ignore it when something new comes out on his overly long delayed archives. It is his music, yes and he can do whatever he pleases with it. he has seemed to forget however, that it's his fans who have bought his music and went to his shows that has provided him with the lifestyle he has and does enjoy. He needs to treat his fans much better and start being a man of his word, instead of a fly by night used car salesman type. I keep hearing so much about the whole PONO thing. It is sad to see so many sycophants continue to champion this lame project. I am 50 years old and had a hearing test 2 weeks ago. They were amazed to find I have perfect hearing, with no loss! It is amazing to me as well because I have been to so many concerts in my life. I have a state of the art home stereo system. I also have an Ipod and have heard the so called holy grail Pono device from a friend. I can tell you there is NO difference to these perfect ears between the 2! Only my high end stereo is vastly different. The Pono was just another of mister Youngs forays into things that further alienate his fans. The poor quality and over-hype was pathetic. He needs to focus on becoming a man of his word and releasing what he has been promising for going on 30 years now. Again, it's his music and he can do as he pleases with it. Even when that means he forgets that without us, the buyers of his music and concert tickets, he would NEVER be able to live the spectacular lifestyle he has over these past 5 decades. This subscription streaming service may be interesting and a very cheap option to the technically astute fan. It all depends on content, cost and how soon new material is added. In one month you can stream a lot of content and anything that streams into a computer is easily captured and ultimately disseminated. This brings to mind questions of copyright and ownership. If you are paying for a streaming service and access, rather than buying a product. Can you legally make 'back ups' of content you haven't directly bought? Because you have only purchased a service. Late to the party here, but give me vinyl! Give me a physical thing I can touch and put on my shelf, etc. I can’t imagine Neil, Elliott, and Reprise not putting out physical copies of everything eventually. Also, did Neil say all the Archives will drop all at once or will they be available on his NYA streaming as they are released? The Neil Young & Elliott Roberts partnership is nothing if not shrewd in ways of business and profits, etc. (and please, I’m not insinuating that profits are all, as obviously, with Neil, we know that’s not true) and is only releasing the Archives via online streaming, even if subscription based, the wisest business decision? I honestly don’t believe that Warner/Reprise will not want to release physical product. I’ve no problem with technology, streaming, etc. but I’m also a record collector (geek). To me,it’s not really in your collection unless it’s sitting on your shelf. I own every Neil Young album on vinyl and all I can say is I’d hoped to have all those NYA PS, NYA ORS, NYA SRS, etc. all lined up on my shelf one day. He’s put out everything on vinyl so far (except the Vol. 1 boxset) so I don’t see him stopping that completely. I guess with Neil, only time will tell.